The first course at my family’s Thanksgiving is always soup. As a kid I didn’t care for soup, but I was always seated next to my Grandpa and he told me if I didn’t finish my soup then I couldn’t have the good stuff that came next. Uh.. no turkey? No mashed potatoes? No pie!? So naturally.. I ate the soup. As I grew up I actually became more of a soup person, I guess somethings are just better with age. 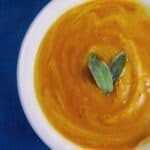 One of my favorite soups has to be this butternut squash soup my Mom makes, that has always been a huge hit at Thanksgiving. I would say the toughest part about Thanksgiving is cooking space. Unless you’re blessed with multiple ovens, a huge range top, things get cramped and stressful real fast. 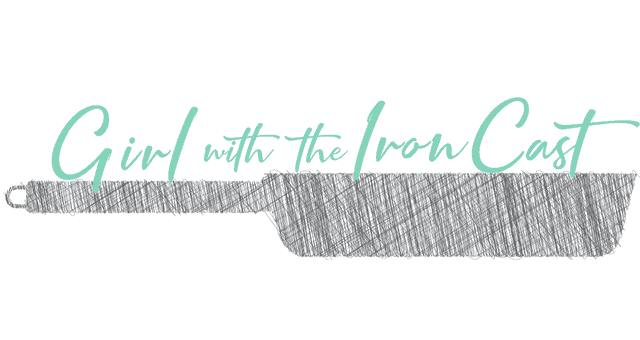 It suddenly becomes a math game of timing when to cook things, whats going in the oven at this time, when to reheat that first dish you put in… (I think we are all getting stressed out just thinking about this already). Enter the slow cooker/crock pot. The slow cooker was one heck of a blessing to the kitchen. Throw all my ingredients in a giant bowl and come back hours later to it being done? SIGN ME UP. I am all about the “set it and forget it”. 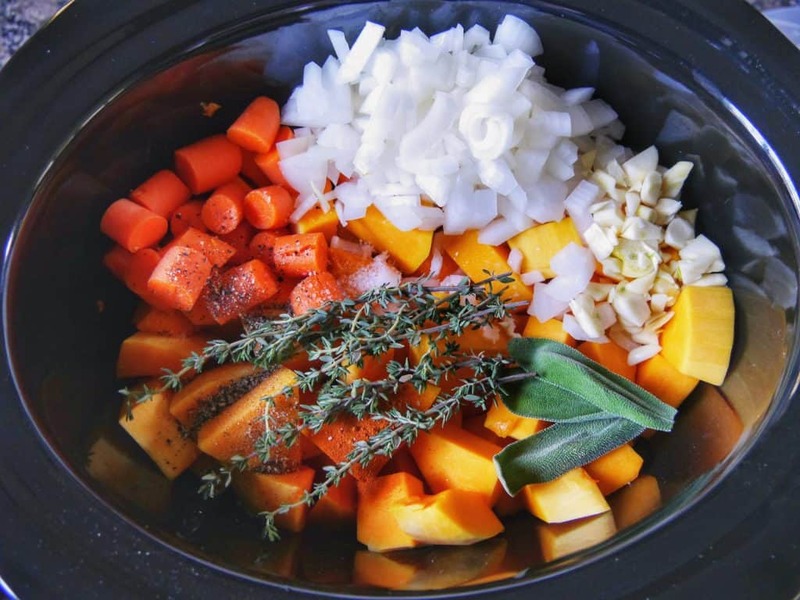 Making the butternut squash soup in the crockpot will free up space on the stove top for more important things and also be one less thing you have to worry about spending time on. I peeled, scooped the seeds out, then sliced up the butternut squash, roughly chopped the onion/garlic, peeled/cut a large carrot, then threw some herbs and broth in and BAM time to move onto something else more important. I removed the fresh thyme and using an immersion blender, blended until smooth. 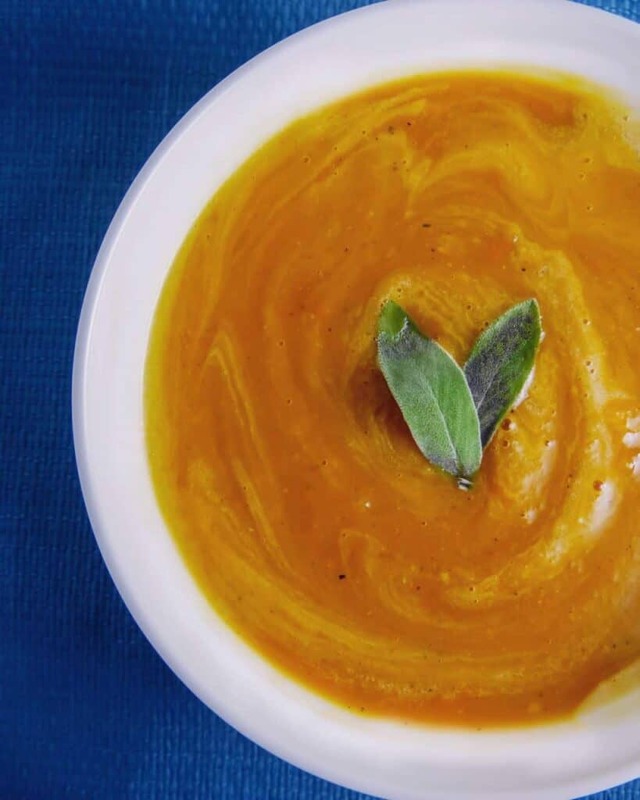 There you have it, slow cooked butternut squash soup! You can top with a swirl of cream (traditional) or I used coconut milk myself. 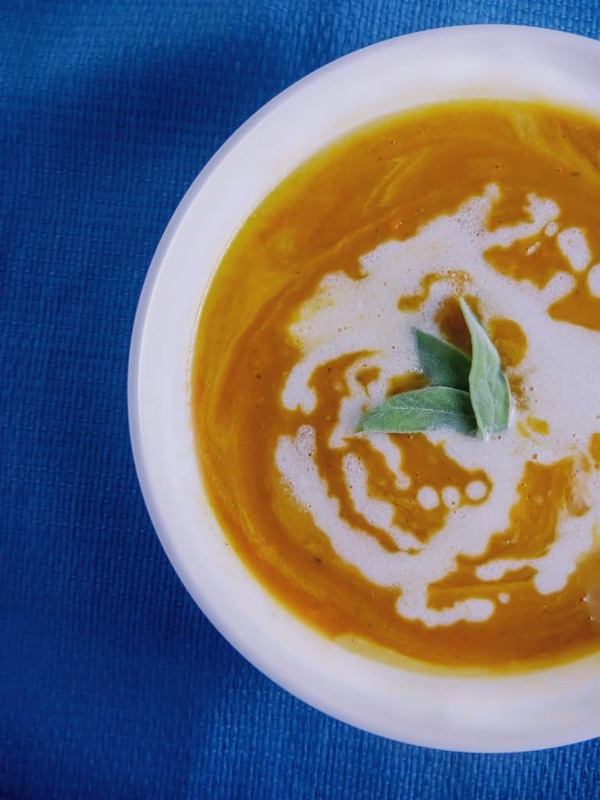 This is a great recipe to kick off your Thanksgiving meal. 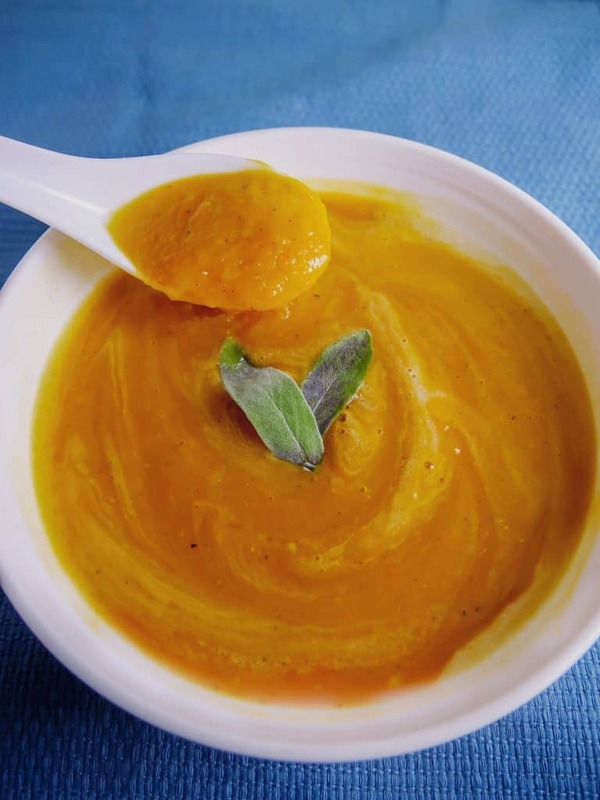 Delicious slow cooker butternut squash soup, easy to assemble and full of flavor. Prepping the butternut squash: Using a vegetable peeler, peel the entire butternut squash. After you’re done peeling, cut the stems off each end. I use a dish towel to secure the squash because it can be slippery and safety first! I made my next cut at the “curvy” part of the squash so you’re left with the long end and circular end. Cut those pieces straight down the middle and using a spoon, scrape the seeds out. Once you have removed the seeds, cut the squash into large cubes. 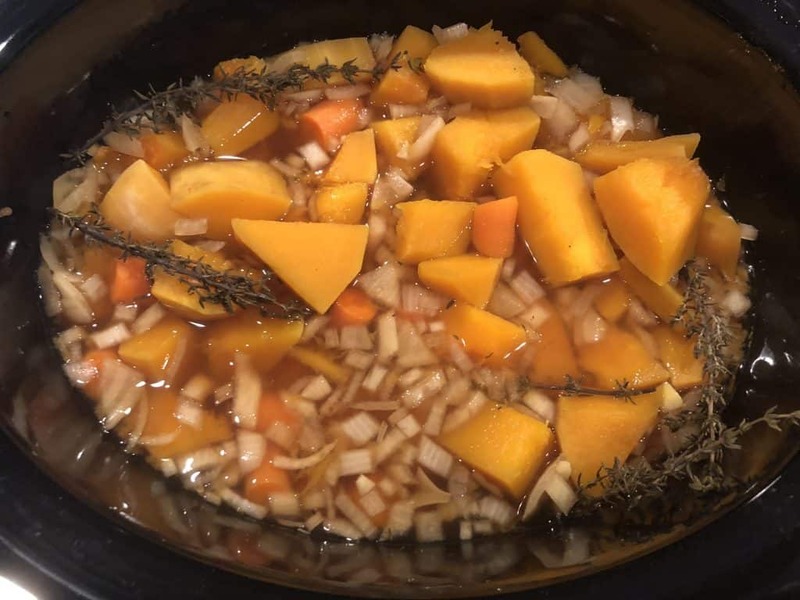 In a crockpot/slow cooker add all the ingredients: Squash, carrot, onion, garlic, salt, pepper, cayenne, bouillon, and vegetable broth. Use a large spoon and stir to mix ingredients. Top with fresh sage and thyme, set on low for 6 hours. After 6 hours, use an immersion blender to blend until smooth. Top with cream or coconut milk and enjoy! I love this recipe. I was not a soup person either, but as you said, things get better with age. Thank you so much Luz, glad this recipe changed your mind about soup! Loved this soup! 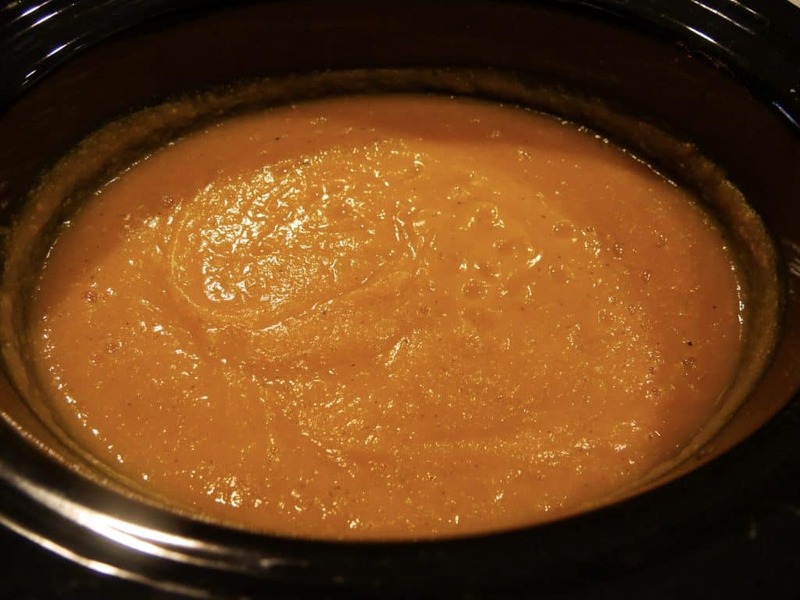 I’m all for a good crockpot meal, and this soup did not disappoint. It was savory and sweet with a little kick. Would definitely make it again!